I am not a fan of wicket keepers playing at 6 and a test eleven comprising 5 batsmen and 5 bowlers including a couple of allrounders. In limited overs cricket, sure that is ideal; but in test matches, definitely not. I am a traditionalist who believes that test cricket is a game for specialists. 6 batsmen, wicket keeper, 4 bowlers. That is the combination to play in a test. If some of the batsmen can bowl and some bowlers can bat then great, but essentially they need to be a force in their specialist department. That is the combination that West Indies used to dominate world cricket for two decades. That is the combination that Australia used to rule world cricket for a decade and a half. That is the combination that Misbah's Pakistan used to remain unbeaten in the UAE and reach the number 1 ranking in test cricket. There is no reason to change that balance. Australia didn't do it with Adam Gilchrist, even though he could easily fit into the top 6 of any test nation. Even England are playing this test at Lord's with this combination. Pakistan changed it around against Ireland, pushing Sarfraz Ahmed up to 6. I did not like it but thought maybe they can afford to against a first time test nation; however they went into this Lord's test with the same combination and I thought it was criminal. I found it extremely strange that after losing your two best and most experienced test batsmen in Misbah and Younis, Pakistan's leadership decided to sacrifice another batsman and play an additional bowler. One would think that an additional batsman would be required to fill the gap left open by Misbah's and Younis' departure. Instead Pakistan have gone into tests in bowler friendly conditions with 5 batsmen, Sarfraz at 6, and 5 bowlers. I don't like it. I feel it makes Pakistan's batting look weak. Sarfraz is not a top 6 test batsman. Some may argue that he averages 40+ in tests and he is good enough to bat at 6, but his form over the past two years has not been good and to promote him at a time like this just does not seem right. Having said all this, seeing how Shadab Khan and Faheem Ashraf have batted at 7 and 8 respectively in these two tests has made me rethink my stance. Shadab has played innings of 55, 4*, and 52 in 3 innings against Ireland and England. Faheem has innings of 83 and 37 in these two tests. The two came together to take Pakistan out of a precarious situation against Ireland when they were reduced to 159-6. 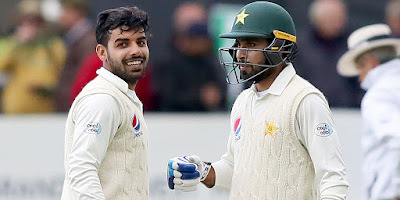 Shadab and Faheem forged a partnership of 117 runs in quick time and ensured Pakistan got a healthy first innings total. 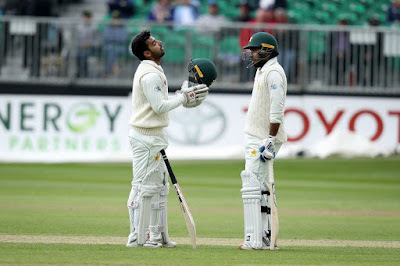 In the ongoing test at Lord's, they again contributed with a steady partnership of 70 odd ensuring that Pakistan did not end their first innings with only a lead of 50. Pakistan's lead in excess of 165 is due to the way Shadab and Faheem batted. The duos current form is covering up for Sarfraz' constant failures at 6. The duos current form has strengthened Pakistan's batting significantly. It also allows some batsmen to be a bit more aggressive. It is heartening to see two young allrounders like Shadab and Faheem put on strong performances in just the first few tests, that too in foreign conditions where subcontinental teams take time to adjust. They are taking wickets, they are scoring runs, they are fielding well - they both provide Pakistan a rare luxury of having two genuine allrounders that are good enough to play all three formats. I am extremely impressed with the discipline Shadab has shown while batting. And I am extremely impressed by the dominance and aggression that Faheem bats with. Faheem has an amazing straight bat and I believe he is one of the best batsmen in the side. Number 8 seems too low for someone like Faheem and I reckon he has the ability to be a long term number 6 for Pakistan in all formats. While I am still not a fan of the combination that Pakistan is playing, I am pleased that they did as it provided all of us the chance to witness the start of two very promising careers of Shadab Khan and Faheem Ashraf.